All interviewed by RT railed against the framing of the sanctions, nominally prompted by the alleged use of chemical weapons against the Skripals in the UK back in March. Russia will be punished with a first set of measures from August 22, and is given 90 days to assure Washington that it will no longer deploy chemical weapons, and to open up its chemical production facilities to international inspectors. Russia can’t admit what it hasn’t done. It’s as if the US is asking Russia, ‘Show us your Yeti’ and if you don’t we will punish you. There are literally no facilities to even show,” Vladimir Kornilov, a political analyst for RIA news agency, said. The very way that the conditions of dropping the sanctions are posed by the US –we will abandon them if you confess your sins and repent– is so humiliating and unacceptable that any response will have to be very firm,” said Andrey Kortunov, Director General of the Russian International Affairs Council. Leonid Polyakov, from the Higher School of Economics, says that Washington must be aware that the Kremlin would never agree to its conditions, so setting them in the first place is a cheap pretense at diplomacy. “Historically, under the current leadership Russia can never do two things. It can never move from officially stated positions on certain international issues and incidents – for example, on Skripal. Russia is not going to turn around and say ‘Sorry, we actually did poison him,’” he said. “And secondly, Vladimir Putin will never agree to any unilateral concessions. Any previous offers Moscow has made are always on a quid-pro-quo basis,” Polyakov pointed out, citing the recent offer by the Russian president to allow the questioning of its citizens involved in alleged election-meddling, but only in exchange for William Browder and others being interviewed by Moscow’s investigators. US ‘showing who’s boss’ or playing to home audience? All three experts agreed that not only will the sanctions be rejected, but they are unlikely to have any indirect effect on Russia’s international policies, or its economic outlook. So, why implement them at all? Kortunov says this is an attempt to claw back international prestige, particularly in the wake of the US failure to impose its will in Syria, fraying relations with Europe and China, and Donald Trump’s perceived softness in negotiating with Putin in Helsinki last month. “This is an attempt to make a statement from the US establishment – to show who is boss in international politics. 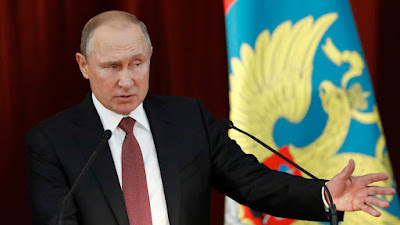 Over the last two or three years the role of the US as the commander-in-chief of world affairs has been cast into doubt, and Russia has been chosen as the whipping boy as Washington tries to reassert control,” Kortunov said. For Polyakov, this is all about “looking strong on Russia” ahead of October’s mid-term elections. “The people putting these sanctions forward aren’t aware of the international consequences. First and foremost, they are driven by a desire to play to their domestic audience, particularly with the midterms coming up. Showing you are not beholden to Russia is a campaign move,” he said to RT. The professor of political science adds that a lack of ideas over how to corral a feisty Russia is pushing American officials to press the sanctions button again and again. “As the saying goes, when you don’t know what to do, do what you know. The international situation is such that no side can expect to back down without losses. Yet Kornilov believes that sanctions are not just a shield for a beleaguered establishment, but an offensive weapon. “It is clear that if it wasn’t going to be the Skripals, it would be something else. Sanctions have become a tool in economic and trade wars, and no one is bothering to hide this,” he said. Since hostility between Moscow and Washington is at a post-war high as it is, Polyakov believes it will be impractical for the two nuclear powers to escalate tensions still further, beyond the headlines. “Any proposed downgrading of diplomatic relations will likely be more symbolic than practical, as there is constant contact between Moscow and Washington that doesn’t go through diplomatic channels, but directly between government departments, for example as in Syria,” he said, referring to the military hotline that has allowed the two countries to operate side-by-side during the ongoing conflict there. “I would not be surprised if the Russian ambassador from Washington is recalled as a counter-measure,” he says, adding that this could detonate all tentative plans between the two countries negotiated at the Helsinki summit. But Vladimir Kornilov isn’t just worried about the State Department steps, but also about a proposed new legislative initiative that aims to stop Russian banks from operating with US clients, and plans to designate the country as a state sponsor of terrorism. “This isn’t just about worsening relations, this is going to be tantamount to a breakdown of diplomatic relations between Moscow and Washington. This will be beyond the pale. I hope Americans come to their senses and step back from the brink,” said the analyst.